This sidewalk sign, known as A-frame, is fabricated in aluminum with a black finish for exterior use. The neutral coloring is the perfect frame for any advertisements. Made with durable materials for long term use. The rugged aluminum extrusion is perfect for outdoor and indoor displays. A-frame is double-sided for twice the exposure. Your sign simply slides down into the channels and onto the ledge of the sidewalk sign at the bottom. This easy installation process allows for quick changes. This sidewalk sign, a folding display, is a portable sign easily set up and stored away at your convenience. Graphic size: 24”W x 36”H Double Sided. Graphic size: 32”W x 48”H Double Sided. Top insert on Metal A-Frame allows for quick Graphics changes. Need A-Frame that allows you to change messaging regularly? We offer A-frame graphics with a dry erase laminate. This means we can print any type of graphic / logos, and then top it off with a laminate that enables use with dry erase markers. If you need something a little more vintage look we also have chalkboards available in standard sizes. 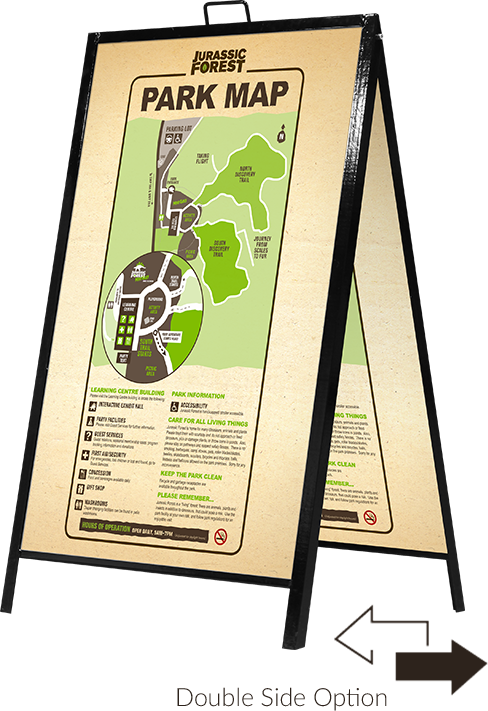 A-Frame graphic inserts can be printed on coroplast or aluminum. A-Frame sign is double side for twice the exposure and message can be viewed from either direction. 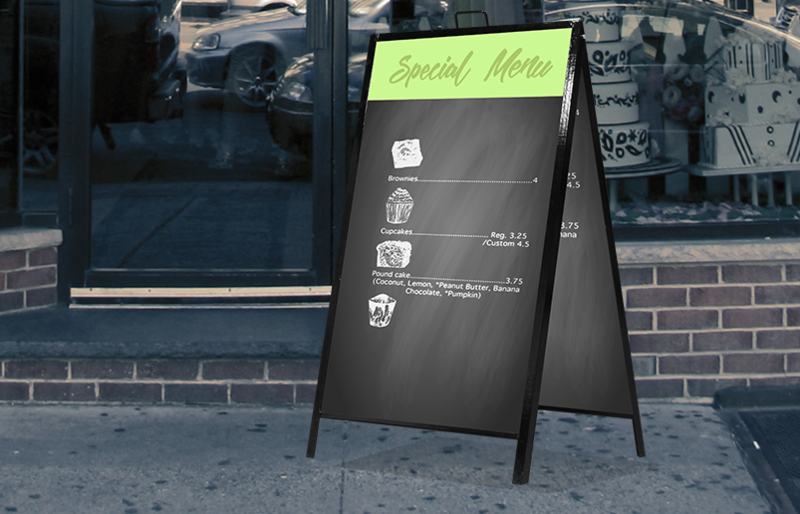 Customize your A-Frame graphics with dry erase lamination which allow quick message changes.